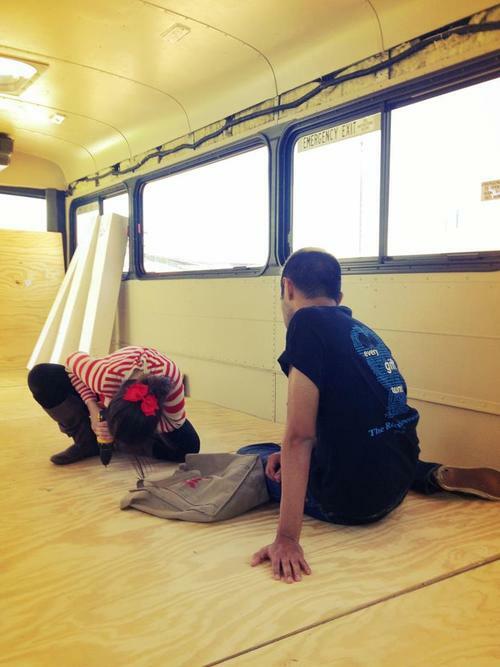 Read how a Rice University art professor and some talented students and volunteers created a DIY traveling artist's colony from a plain transit bus. 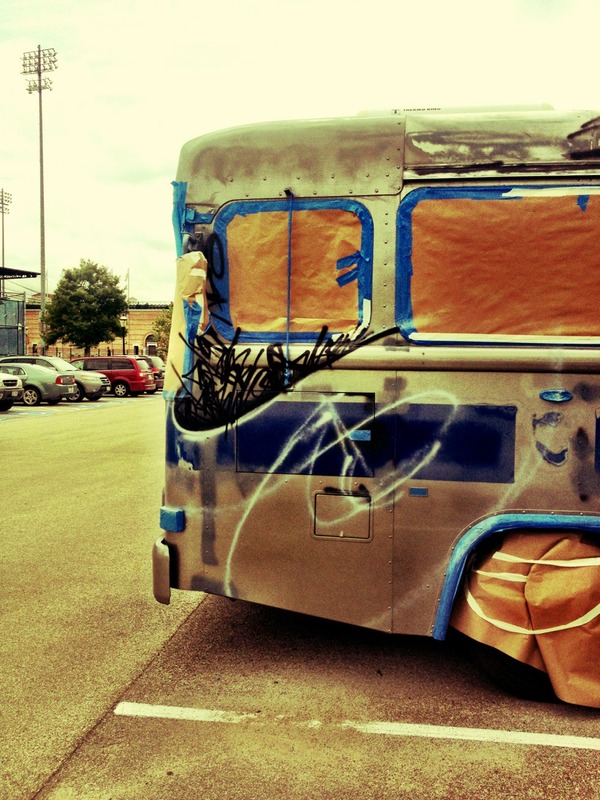 What happens when a group of professional artists and art students get together and decide to make their own DIY RV? What is the Cargo Space? 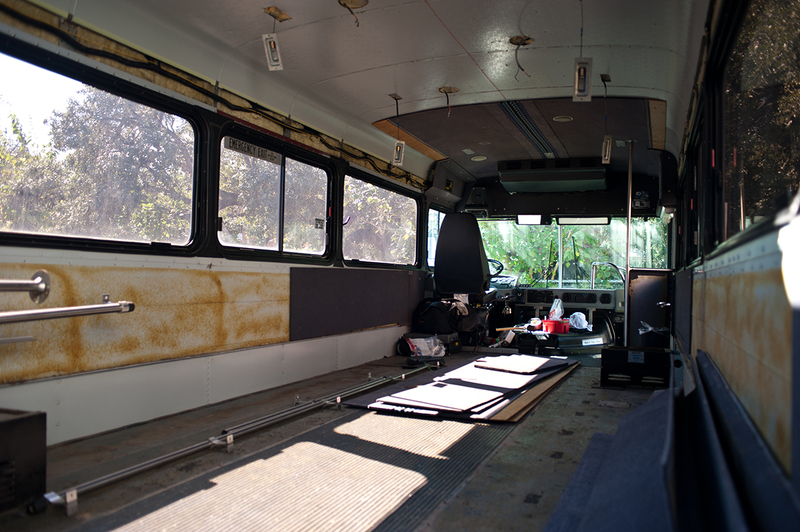 The Cargo Space is a transformed and redesigned transit bus with a living space that sleeps five (soon to be six) people. 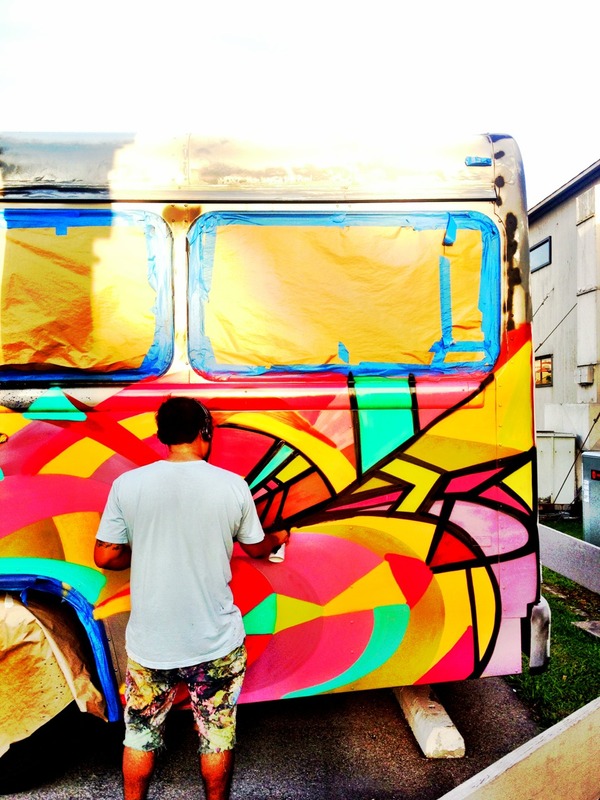 It’s designed as a mobile artist’s colony linking visual artists across the country. 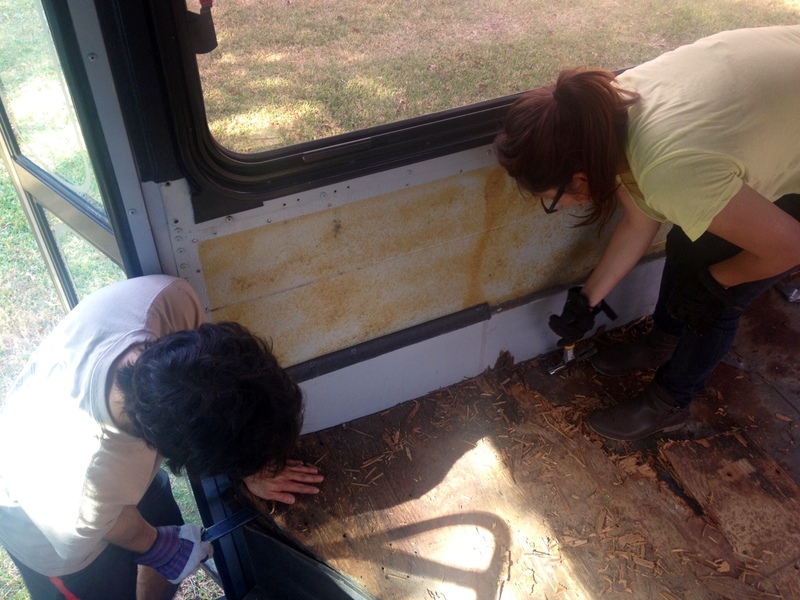 Forty volunteers around Rice University in Houston took almost two years to transform this former shuttle bus into a cozy, habitable space. 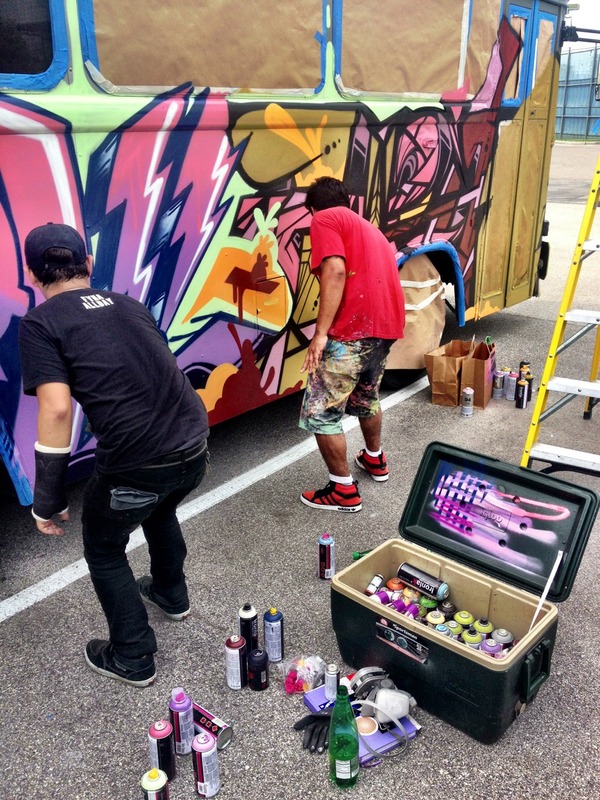 The exterior was painted by stars of the local graffiti and street art scene including Dual and Daniel Anguilu. 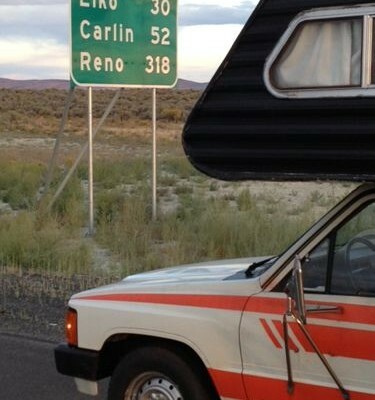 The Cargo Space will travel this summer from Houston to Wisconsin (Institute of Visual Arts, Milwaukee), Minnesota (The Walker Art Center) and Illinois (Columbia College in Chicago and Bradley University in Peoria). 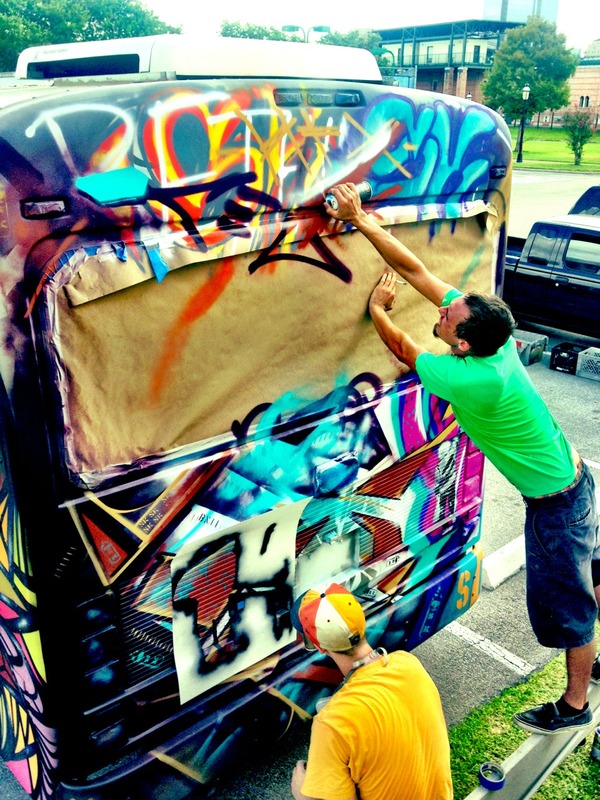 The project was spearheaded by Chris Sperandio, a well-known artist and professor of art at Rice University. Sperandio is a founding member of KartoonKings, a media company engaged in the production of comic books, animations and films. Kartoon Kings is in partnership with Sperandio’s long-time collaborative partner, Simon Grennan. 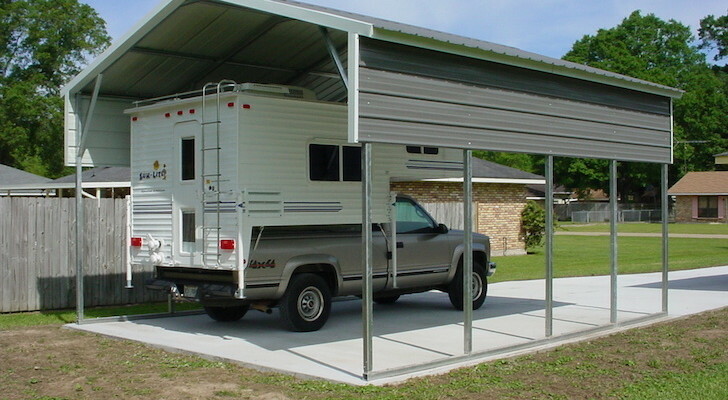 What was your biggest challenge in bringing the Cargo Space to life? The project was challenging in that for each aspect of the construction, I had to learn new skills. 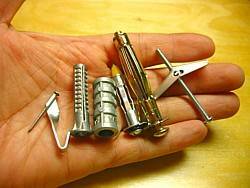 I came to it without a lot of ability but much enthusiasm. I had to teach myself about flooring, insulation, plumbing and everything else! 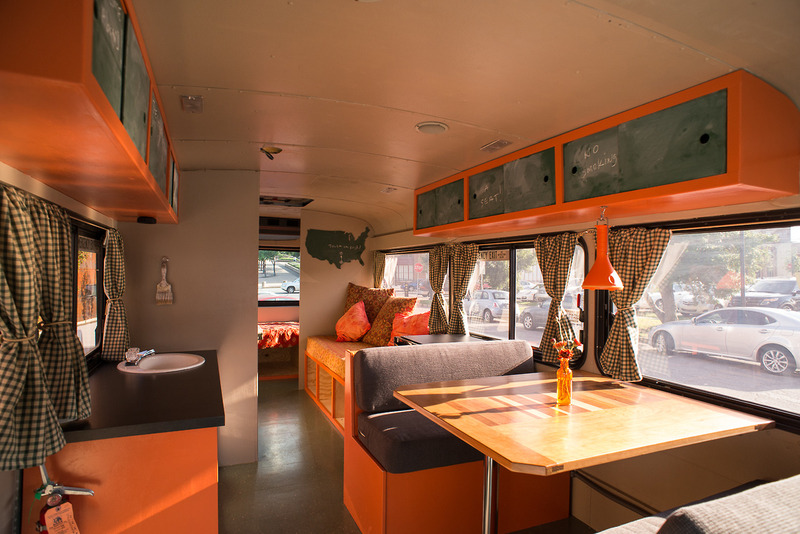 If you could do one thing differently in the design / remodel of the bus what would it be and why? I learned so much along the way, that some days all I see are the mistakes I made. I wish I were a better plumber, that’s for sure. If I could change one thing, it would be the placement of the lavatory. I should have put it on the driver’s side. 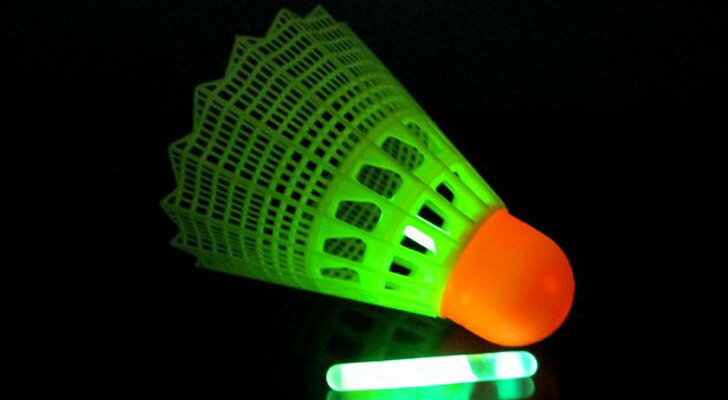 Having it there would give me greater visibility when driving. 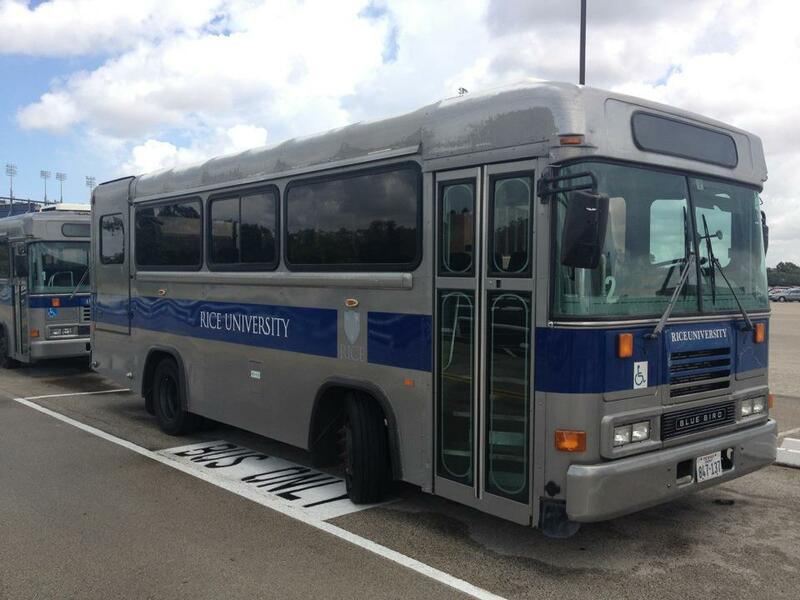 What are the plans for the bus during the academic year? 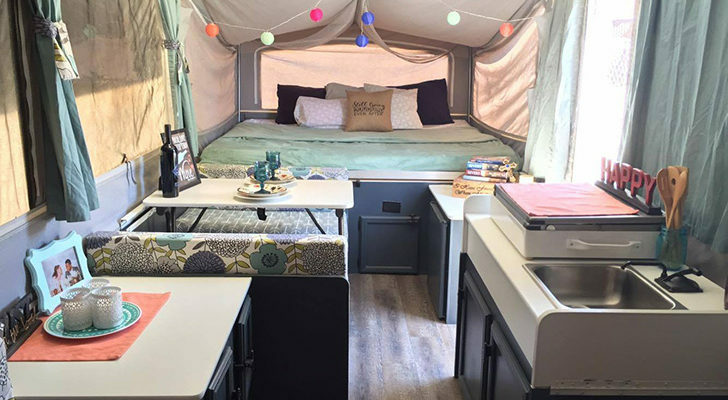 The Cargo Space will be back and forth between the The Institute of Visual Art in Milwaukee and A&D Gallery at Columbia College in Chicago in August and September, and then at Bradley University in Peoria on October 2, and Washington University in St. Louis the following week. I’d love to take the bus to Mexico City for the month of December, but that’s still only in the planning stages. After that, I will probably rest for a few months. 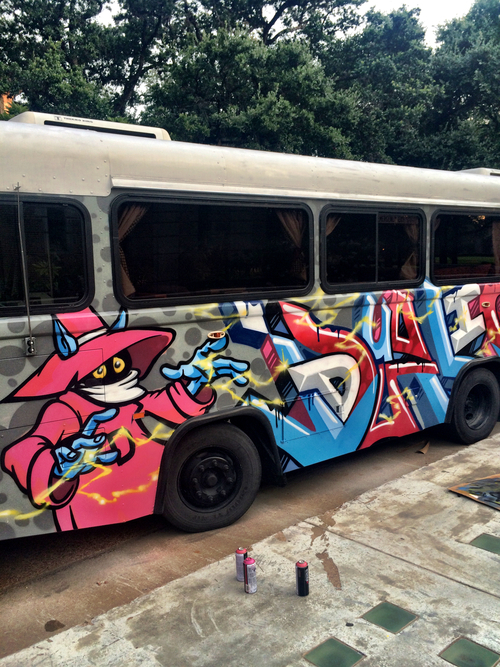 My ultimate plan is to try to drive the bus to South America, working with artists and museums along the way. 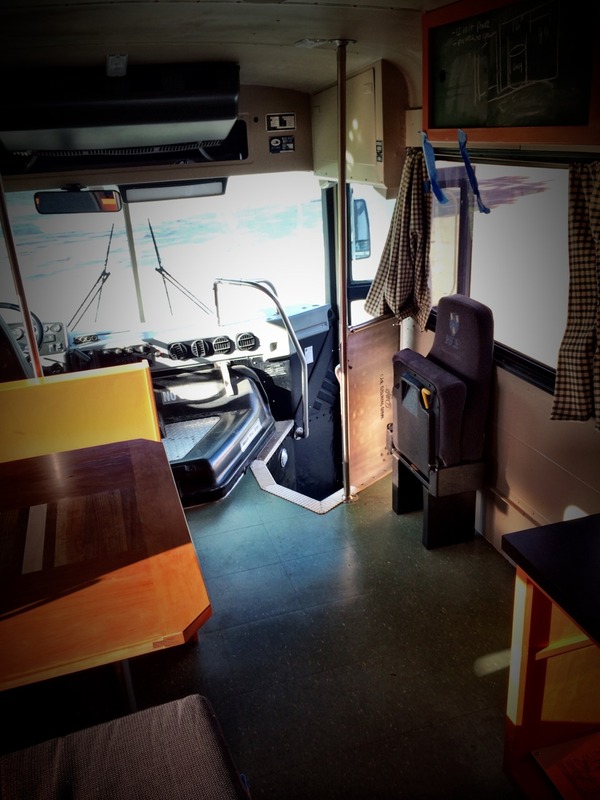 Motivated by the vast, open spaces of the American Southwest, and fueled by a small grant from Rice University’s Humanities Research Center, we’ve acquired a transit bus and are refurbishing it as a mobile arts platform: part rockstar-style tour bus, part utility vehicle and ultimately a blank platform that sleeps six. The goal is to play host to cultural workers of all stripes (local, national, international), artists, writers, et al. We’ll take extensive road trips, hold one-night events and host all manner of functions around Houston and around the country. What the artists wanted was a blank canvas. They found it in the form of a 2002 Blue Bird CS Transit Bus. Although they would have liked something larger than this 25 footer, because the project was funded primarily by Rice University, Sperandio and Grennan took what they could get. 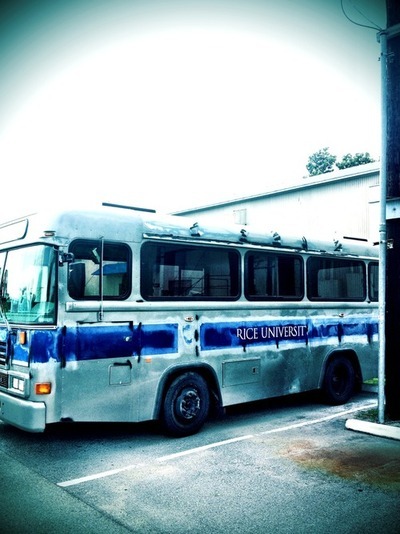 Both the title and registration are with Rice University – so the bus is truly an academic project. The two had to work with many departments of Rice to get funding and start work on the project. They even had to work with campus fire and security to obtain a parking spot that was close to electricity, internet and a bathroom. Since the Blue Bird bus is not designed for full time living, Sperandio had to route required electrical and plumbing lines through the already-crowded undercarriage. 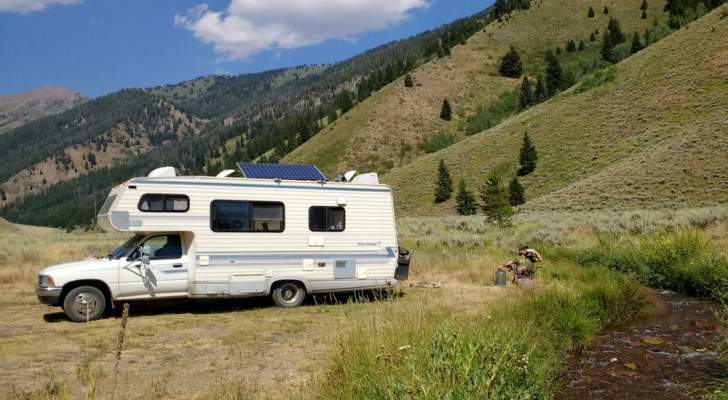 Converting a bus for full-time living is not a simple affair. 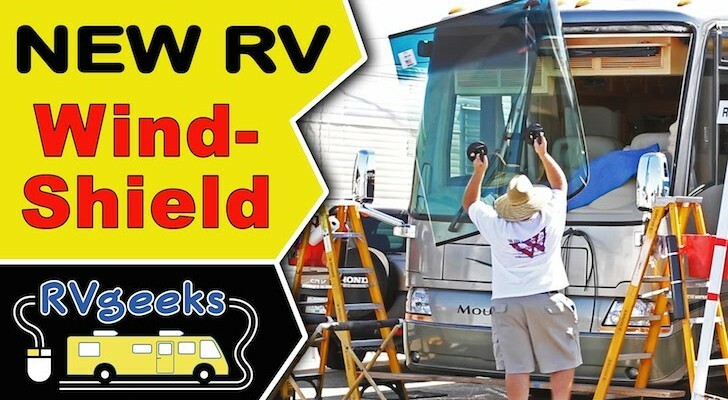 One of the biggest challenges was re-engineering an undercarriage that was never designed to accommodate the systems required of a full-time RV. 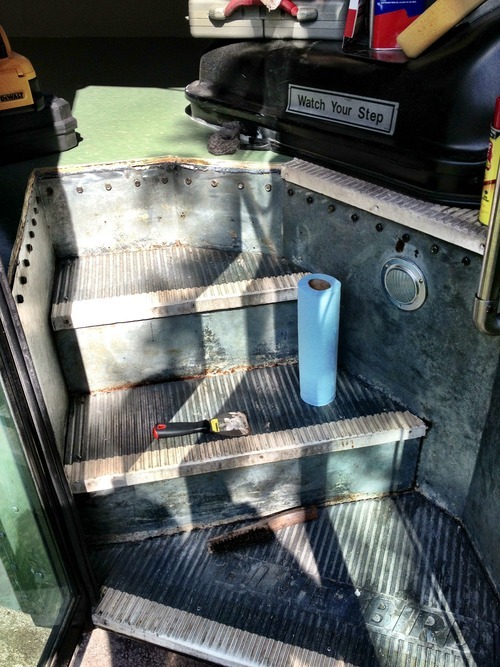 Luckily the bus had a few unused voids that could be filled with the necessary equipment. 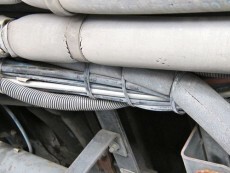 Once a rough sketch of the undercarriage was made, Sperandio and his crew set out preparing the bus for the renovation. 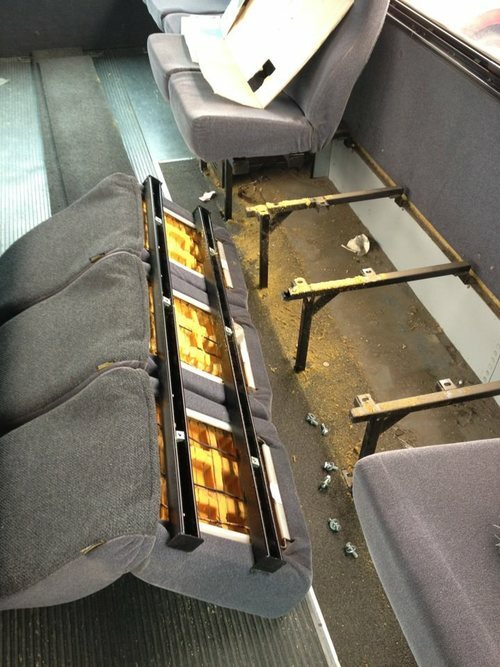 The first items removed were the seats. 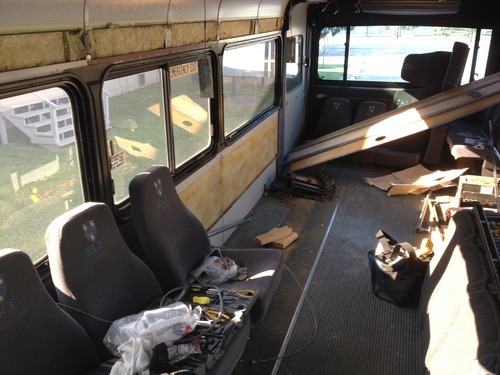 With the seats out, work began on gutting the rest of the interior. After the student volunteers removed the old flooring and dried caulk, they laid down a new plywood subfloor with self-tapping screws. 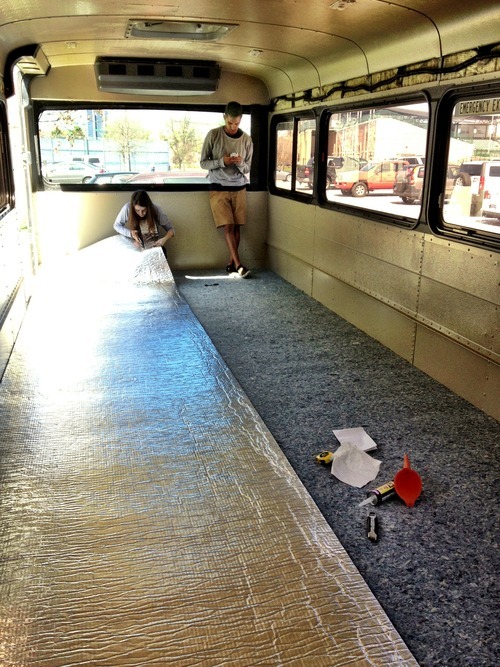 One of the cool design features that Sperandio and his crew added to the CargoSpace was lots of sound-deadening insulation. 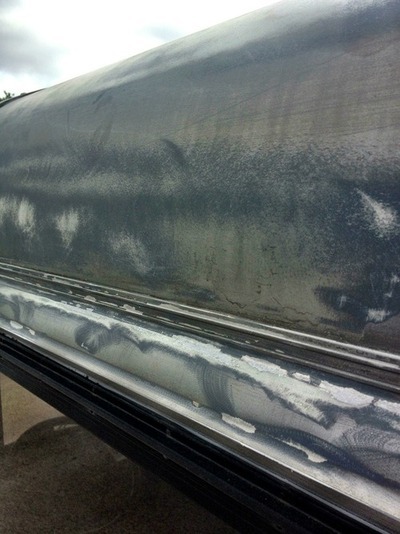 UltraTouch insulation has many uses, but is commonly wrapped around water heaters to thermally insulate the tank. It’s also great for reducing unwanted noise. 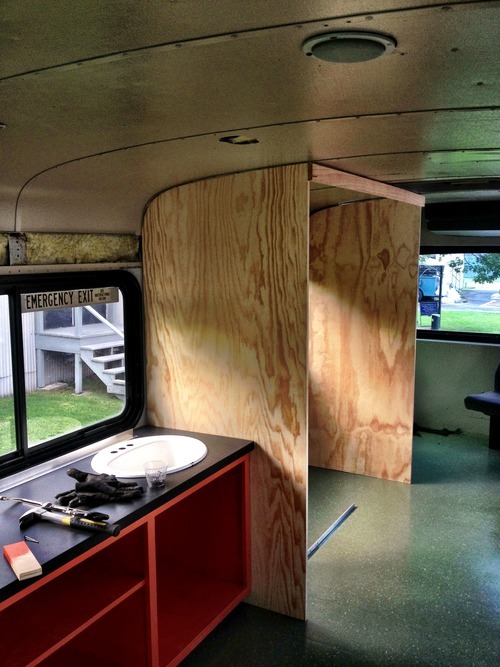 The crew had a tough time getting the self-tapping screws to hold through the 3/4″ plywood sheets and insulation. 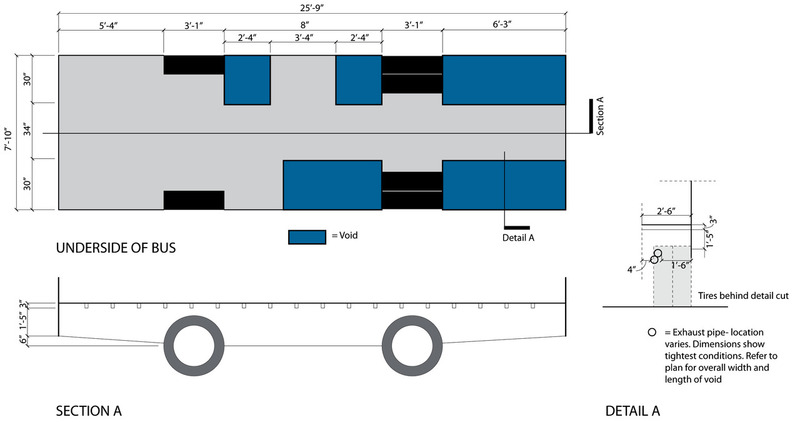 A lot of technology was used in the design and fabrication of the Cargo Space. 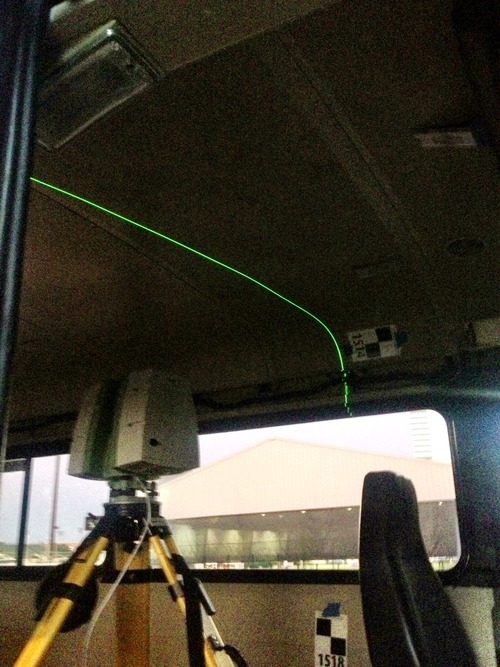 Once the bus was gutted, the team used a laser plotting system to make a detailed 3-D model of the interior and exterior of the bus. The team that did this for Sperandio, Smart GeoMetrics, performed the same type of scan on the space shuttle! 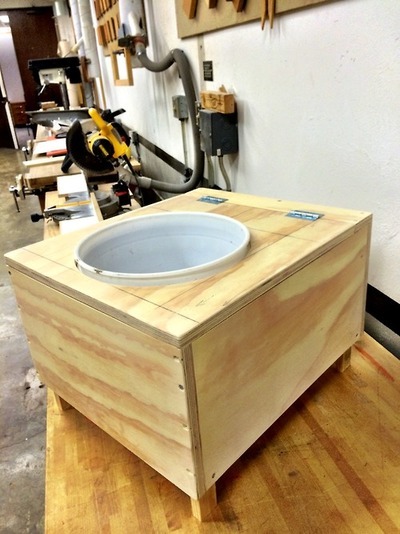 Rhino crunched the scan data to make the design of custom-fit furniture quick and easy. 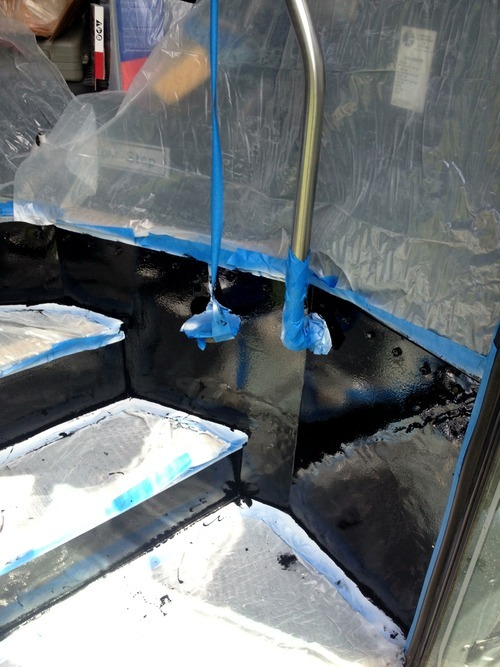 The risers and sidewalls were originally covered with a thick vinyl. 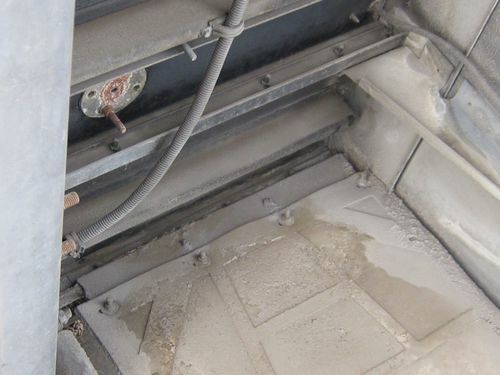 While the sheet metal looks a little like it’s been kicked to death, we can’t really stomach the idea of encasing this area back up in some sort of sheathing. 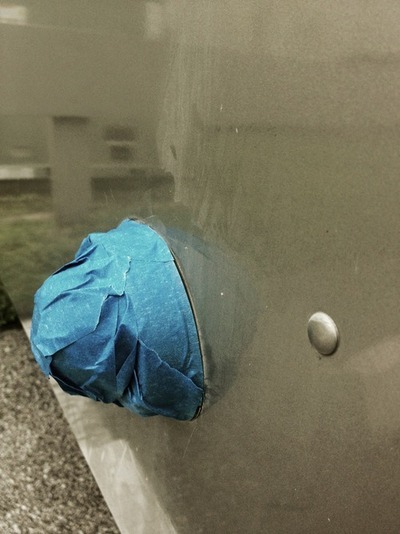 We [painted and primed] the metal… It’s the simplest measure we can take, and doesn’t preclude some other solution in the future. The custom-built kitchenette went in first, followed by other pieces of furniture. 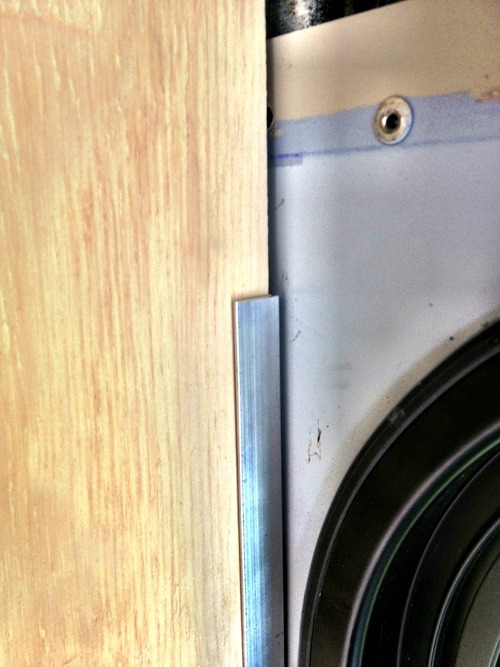 Instead of using 2″ x 2″s for the framing, Sperandio’s team used aluminum channels to hold the 3/4″ plywood panels. 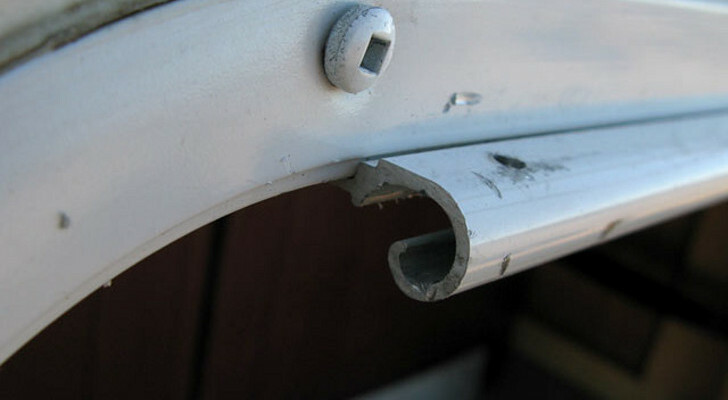 This technique produces a more stable product than standard framing methods. 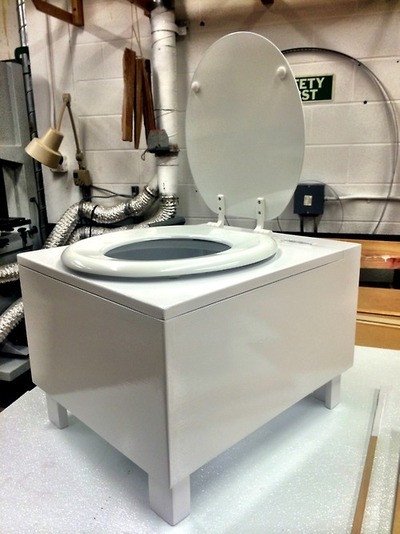 The Cargo Space recently got a DIY composting toilet, but it’s still for emergency use only. No, not this $1,000 one. 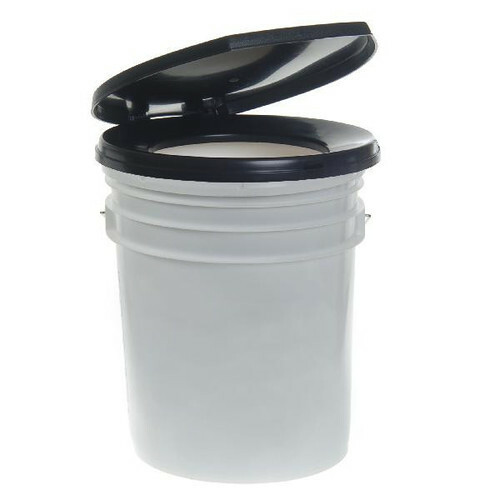 A five gallon bucket one. 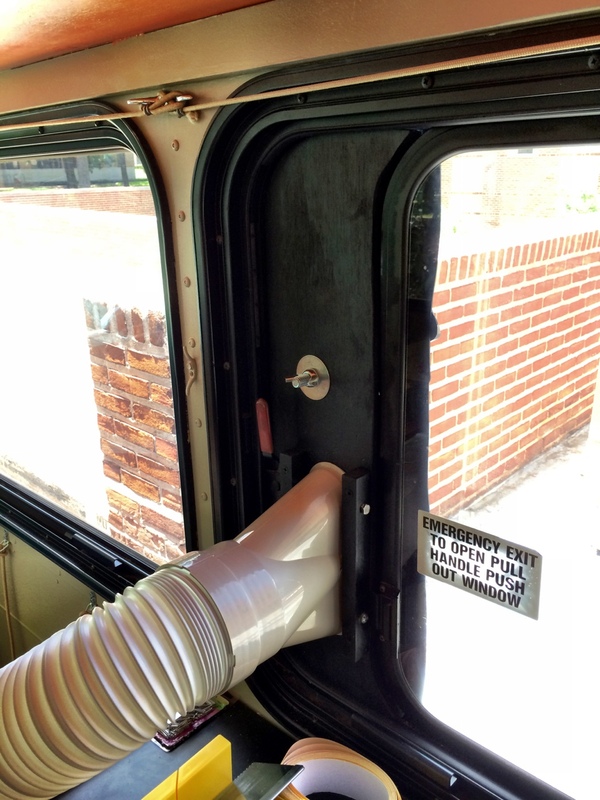 They made a DIY air conditioner window vent to prevent having to drill through the bus frame. 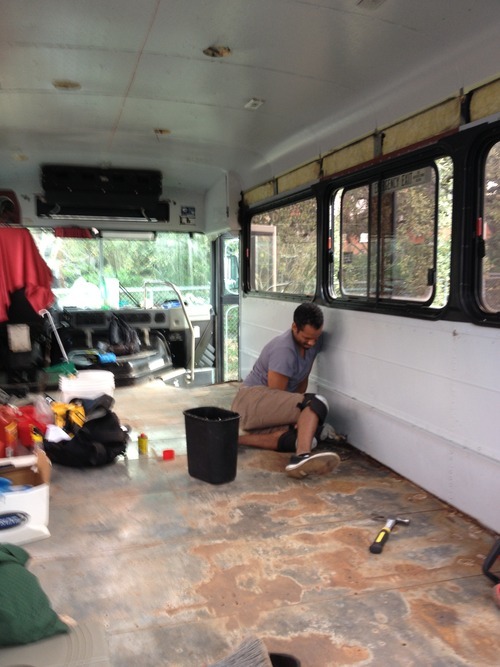 The team sanded the exterior of the bus, removing all Rice labeling and the old, flaking paint. And let the pros do their thing. The crew left the roof white to reduce heat build-up. 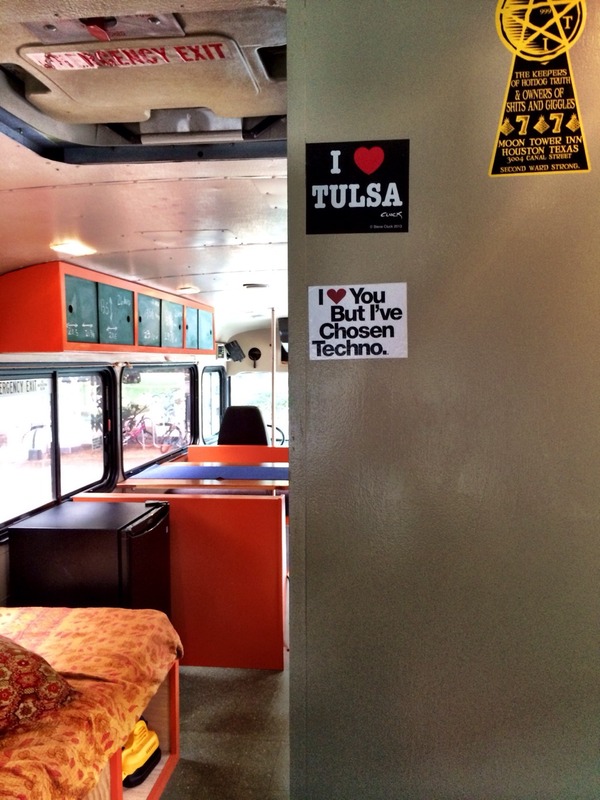 The Cargo Space bus was first featured in an exhibit at Tulsa’s Hardesty Arts Center. You can get the book about the Cargo Space and it’s first exhibit at Tulsa here. 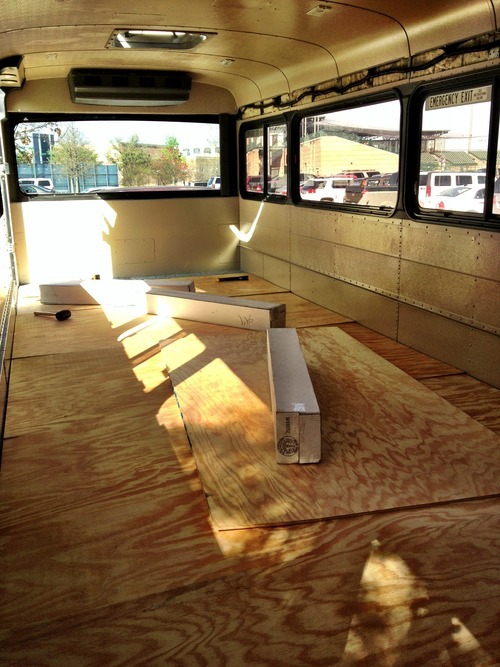 For more information be sure to follow the Cargo Space Facebook page or check out the project’s website.